Akshat Jain, IAS Topper Rank 2, is a household name now and needs no detailed introduction. But it should be known to all that this success is not a result of one or two months hard work, but it is a result of continuous hard work since his early school days. In this video interview, Akshat Jain specifically told that IAS candidates should also keep time for the hobbies side by side with their studies. The Civil Services Exam demands a string base of fundamental knowledge, which can be achieved only through conceptual learning of the Intertwined concepts. Akshat Jain was influenced by his parents in his early life and decided to prepare for the IAS Exam. Akshat’s father, Mr. D C Jain, is Joint Director in the Central Bureau of Investigation (CBI), New Delhi and mother, Mrs. Simmi Jain, an Indian Revenue Service (IRS) officer is the ADG of National Academy of Customs, Indirect Taxes and Narcotics (NACIN) in Jaipur. Akshat Jain also worked in Samsung R&D Institute Banglore. He got his Secondary education from India International School Jaipur. He is very much interested in the extracurricular activities during his graduation and school days. Since childhood,Akshat Jain had started thinking of preparing IAS by taking inspiration from his parents. Their desire has been fulfilled. When All India Rank 2 arrives, his family members are feeling glorified. 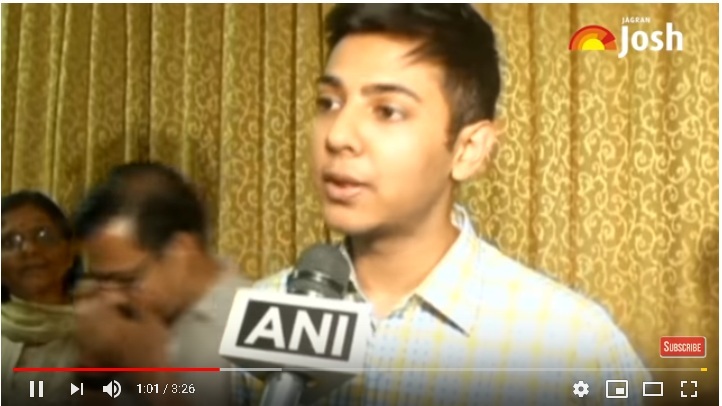 Akshat Jain thanked God his family and friends for the grand success in the IAS Exam 2018. He said the person support system is very important during the tough times of the UPSC IAS preparation. He talks about Patience and disappointments which came across the IAS preparation. He followed a very balanced strategy for the IAS Preparation. He balanced his studies and hobbies. He emphasised the importance of Notes making. He read less number of books but revised them thoroughly so that the concepts become clear. In addition to that, he stressed the practice of answer writing. He mentioned that tracking the direction of the IAS preparation can only be done by practicing with various test papers, mock papers, and previous year question papers. His father always asks about his IAS Preparation. He said that do not follow anyone without knowing your strengths an weaknesses. He said that assess yourself first and prepare your own plan for the IAS Preparation. His harwork has given him chance to serve the people of the society.